The African Union has suspended Madagascar after the army forced out the president and installed the opposition leader in his place. Southern African leaders say they may impose sanctions on the Indian Ocean island unless legality is restored. Former colonial power France has also condemned the seizure of power, while the US has suspended some aid. 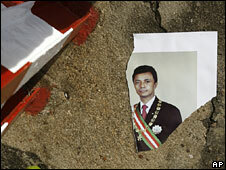 But Madagascar's acting prime minister rejected growing international criticism of his government. Although the handover in Madagascar was not a straightforward military seizure of power, an AU official said it had not been constitutional. "The council is of the opinion that what occurred in Madagascar enters the definition of unconstitutional change of government," said Burkina Faso's Ambassador Bruno Nongoma Zidouemba, Chairman of the AU's Peace and Security Council (PSC). "The council then decided to suspend the participation of Madagascar to the bodies and organs of the AU." The suspension poses a problem for the African Union because Madagascar is due to hold its next summit meeting in July. "If they don't comply it will affect the hosting of the summit," Jeffrey Mugumyia, the AU's PSC director said. "The sooner they comply the better. But anything can happen in the meantime." France and the US both described the takeover as a coup and the US said it would block non-humanitarian aid. President Marc Ravalomanana resigned on Tuesday under pressure from a section of the army, which insisted that opposition leader Andry Rajoelina, a 34-year-old former disc-jockey, should take over. Mr Rajoelina is due to be inaugurated at a ceremony in the capital on Saturday after Madagascar's Constitutional Court approved the handover of power. But Roindefo Monja, prime minister in Rajoelina's transitional administration, told Reuters news agency the new government stood by its actions. "We will explain to the whole world our cause," Mr Monja said via telephone. "The people demanded liberty and the military rallied to the popular movement, but it did not seize power... We are confident the international community will understand," he said. Also on Friday, the Southern African Development Community said it would discuss imposing sanctions on Madagascar when they meet in Johannesburg on 30 March. "We will put pressure on Madagascar and particularly on those people who have ousted the democratically elected leader of that country," South Africa's Defence Minister Charles Nqakula was quoted as saying by AFP news agency. 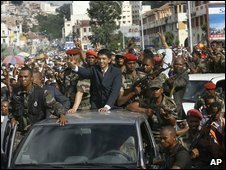 "The problem in Madagascar is that Rajoelina seized power unconstitutionally," he added. "There is a thoroughgoing abhorrence to this kind of action." As for the AU, the crucial question was whether Madagascar followed constitutional procedures when a president resigns - these call for the head of parliament's upper house to take over, and for elections within two months. As this did not happen, they decided it could be considered a coup. The AU has suspended both Mauritania and Guinea after military takeovers in recent months. The BBC's Elizabeth Blunt at the AU headquarters in Addis Ababa says Madagascar now has six months to restore constitutional order, or the AU can impose sanctions. She says these would normally target members of the government. French President Nicolas Sarkozy on Friday joined the EU and US in condemning the power grab. "Of course it's a coup d'etat," Mr Sarkozy told a news conference at the end of a two-day European Union summit in Brussels. "I greatly regret what has happened in Madagascar and I call for elections as soon as possible, which is the only way out of this imbroglio." Mr Rajoelina has suspended parliament and set up two transitional bodies to run the country. He says he wants to change the constitution, which at present bars him from contesting presidential elections, as he is six years too young. There is still no word on the whereabouts of Mr Ravalomanana, whose re-election to a second term in 2006 could not save him from being ousted.